Since balancing work and motherhood (and life in general!) can often be a challenging feat, we love hearing from modern moms who answer the perennial question, “How does she do it?” in their own unique ways. 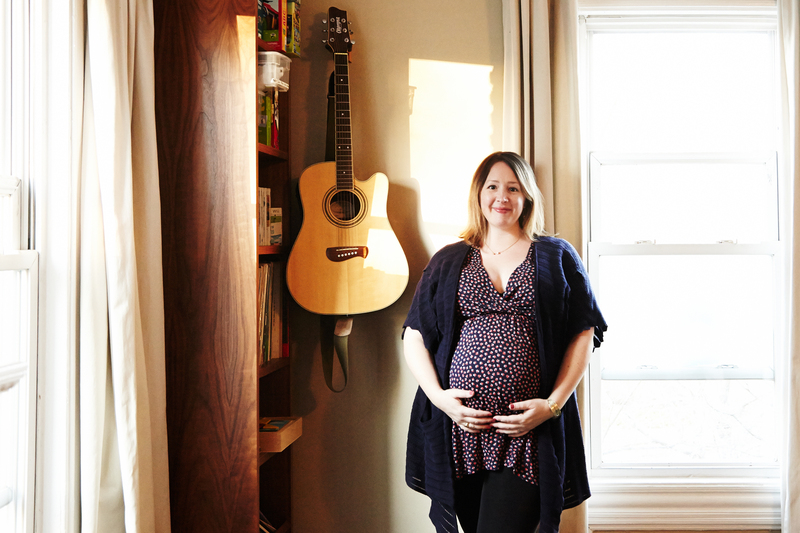 Enter Karina Linch, a full-time working mom of three boys (Max, 6, Sam, 3, and Finn, 10 days!) whose unconventional living situation and crazy-cool job piqued our interest. Here, we chat with the Montclair, NJ-based mom about everything from the village it takes to raise a child to the importance of a family-friendly workplace. Family heirloom and childhood memories fill their Montclair, NJ home. I spent many of my formative years on our horse farm in Virginia. My childhood was full of magic and adventure. There was a lot of freedom and even a little danger. I got thrown off plenty of horses, knew how to avoid the copperheads when playing in the creek, and even had a tornado rip the barn roof off above my head. Karina commute three days a week to BrainPOP’s Manhattan office. I’m a Senior Vice President of Product at BrainPOP. I get to make the educational tools and content that I wish I had when I was teaching. It’s pretty much the best job in the world. BrainPOP fan art adorns the walls of the office. What led you to finding your dream job? I began my career in advertising, producing TV and radio commercials. Lots of fun, but it didn’t feed my soul. Right after September 11th, I applied to be a New York City Teaching Fellow. I spent the next few years teaching filmmaking and technology in the Bronx, before finding a wonderful school in Brooklyn where I taught 5th grade. I loved teaching, but I was offered the chance to build a new product for BrainPOP. I made the leap and my new job combined my background in filmmaking and production with education. I’ve been at BrainPOP for 11 years and I hope to be there for many years to come. We are on a mission to help teachers and students. It feels more important than ever. The things we make are going to help build a child’s understanding of the world. That’s a big responsibility. It’s a cliché, but being a mom does make you more efficient. Every 15 minutes of my day is scheduled, which can be annoying, but ultimately I’m able to squeeze everything in and still make my train. A shorter meeting with a clear agenda is more productive anyway. I’m glad that my kids get to see that I’m their mom, but they also get to see that I’m this whole other person too. I bring them with me on work trips when possible and they’ve been able to travel all over the world. To work for a company that you respect and shares your values. Or build one. I work for a company that shares my values and is extremely family friendly. And that’s what makes everything possible. Nine months pregnant at our photo shoot, Karina prefers flowy blouses and comfy leggings. In what specific ways is Brainpop a family-friendly workplace? BrainPOP was founded by a immunologist and pediatrician, so employee well-being has always been a top priority. BrainPOP provides benefits like fully-paid parental leave, flexible work arrangements, and a pumping room. A healthy work-life balance is actually achievable. And the team is amazingly supportive of one another, whether they have kids or not. Everyone needs help at some point, be it caring for a sick parent or dealing with personal health issues, and it makes it bearable when your company and colleagues have your back. Kids and screen time is a hot topic. What’s your take on the issue? Use common sense. Choose quality experiences for your kids. Practice co-viewing, actively ask questions, and make connections. Play together. Make stuff. Tell us about where you would like to see educational technology in the future? I’d like to see kids making, creating, designing, and experimenting more. lyrics to songs. Listen to podcasts and audiobooks in the car. Our oldest kid wanted a computer, so we made one with him (a Raspberry Pi). If your kids like playing games, have them design their own. Use sites like Common Sense Media to learn about appropriate movies, apps, and games. Lots of al fresco communal dinners at the Linch/Chitwood household. Tell us about your current living situation: We were too chicken to leave the city by ourselves, so we moved from Brooklyn to Montclair with my sister’s family. We bought an old Victorian that’s split into a two family. My sister, brother-in-law and two nephews live on the first floor. My husband and I and our three little boys live on the top two floors. It’s just a really wonderful thing that I recommend to anybody. Try a non-traditional living situation. Karina and her sister Natalie (also our super talented photographer!) at a local Farmer’s Market. It’s been amazing to have built-in family support and develop such close relationships with my nephews. I love hanging out in the communal backyard and eating meals together. Sharing a house has also been a great way to save money! Between us we have five boys ranging from 10 days to 6-years-old. It can feel a bit like a light-saber-wielding-basketball-team is living inside the house. There’s a lot of joy and laughter, but it’s not for the faint of heart. From left to right: Freedy, 6, Max, 6, Wynn, 3, Sam, 2. What makes you the most nervous going from two kids to three? Being able to spend enough one-on-one time with each boy, especially my oldest. At 6, he’s the most capable and demands less attention, but we still need special time together. It changed in every way. Even in some weird ways. Like now I have an irrational fear of bears. Never had that before. What’s “me” time? I guess that would be reading. I get some of my best reading done in the middle of the night. One kid always seems to wake up and needs to go to the potty/get a glass of water/ have a snuggle and then I can’t fall back asleep. What did you learn about parenting from your mom that you’ve adopted with your own children? I really had a magical childhood and what I think I take from my mom the most is how fearless she was. She moved to a brand new country. She picked us up and moved us to a farm, at one point. And we just were always on an adventure.What’s one thing you would tell your 20-year-old self? It all turns out ok. If something doesn’t seem right, change it. Work hard for the things you believe in, but take time for yourself too. Marry the boy in the band.Who or what inspires you? I’m inspired by teachers. Most teachers I know work incredibly hard. The level of passion. Karina’s style favorites include Anthropologie, ASOS, Gap, and Lucky Brand. You’re a self-described tech nerd. Tell us a bit about that. My favorite summer activities include Maker Faire, Renaissance Faire, and geocaching on road trips with my kids. I’m the voice of a cartoon character. I got invited to participate in the White House’s first Game Jam. I like playing board games and collecting children’s books. Karina stayed comfortable through her pregnancy in maternity styles and yoga wear. I definitely like things that are eclectic and fun but not too flashy and don’t draw too much attention. Karina loves floral prints and bold accessories that add a fun pop to her workday looks. What’s your philosophy on fashion? Don’t try too hard. Eclectic is nice, but so is comfortable. How do you keep up with it all? Any life hacks? We have over 20 Google calendars for our family; it’s a bit ridiculous. My husband and I are project manager types. We use Asana, Slack, You Need a Budget, Mint, Dropbox, Pinterest, and Google Docs with each other. Some people have coat closets. We have a media server room. “Some people have coat closets. Karina and her husband John share an office on their work-from-home days. Since our photo shoot, Karina and her family welcomed a beautiful baby boy into their lives. Congrats Karina! From left to right: Karina, Max, Finn, John, Sam.